Cheryl Johnson, Vice President, Health Care Services, VSP Vision Care, USA. Vision care plays an important role in the early detection and prevention of disease. The collaboration of evidence-based eye care with healthcare will have a positive impact on patient care and healthcare savings. In the US, all citizens are faced with healthcare costs that are increasing at alarming rates and they show no sign of slowing. Employers dealing with rising costs are promoting preventive care as a way to encourage wellness, and provide opportunities for early detection of disease. Hence, children and adults should get a comprehensive exam at least every two years. More and more, vision care is becoming recognised as a key element in overall body health. It has become an integral part of the healthcare continuum. Vision care is an easy, as well as effective, entry into the healthcare system. Research from the US Census Bureau, the National Center for Health Statistics and VSP Vision Care show that working citizens with vision coverage get eye exams nearly four times more frequently than physicals, 61 per cent versus 16 per cent. This is significant because the eyes are the only places on the body that provide an unobstructed, non-invasive view of the blood vessels. Through comprehensive eye exams, eye doctors can diagnose serious eye diseases including glaucoma, macular degeneration and diabetic retinopathy. They can also detect symptoms of serious systemic conditions such as diabetes, high cholesterol and hypertension. Often these conditions yield no symptoms in the early stages and early detection offers opportunities for disease management and prevention of blindness and more serious illness. According to the Center for Disease Control, more than 90 million Americans live with chronic diseases. Treatment for these diseases account for more than 75 per cent of the nation's US$ 1.4 trillion medical care costs. 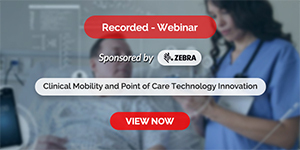 The growing awareness about the connection between vision care and total body health is redefining what vision plans need to provide. It's more than just coverage for glasses and contacts, but a more integrated approach to data sharing between practitioners health plans and disease management companies. VSP Vision Care, the largest eye health benefit provider in the US with 52 million members and more than 24,000 private-practice network doctors, is at the forefront of a continuity of care approach. VSP doctors, conducting comprehensive eye exams, can detect signs of serious eye conditions including glaucoma, macular degeneration, diabetic retinopathy and cataracts. In addition, annual eye exams can detect signs of systemic conditions including diabetes, high cholesterol, high blood pressure and heart disease before serious damage occurs. Unique in the marketplace, their private practice doctors give personalised care and develop long-term relationships with patients and their families. In fact, VSP doctors know their patients so well that they can see even minor changes in their eyes over time. With their best practice medical guidelines, comprehensive eye exam standards and coordination with primary case physicians, all members receive quality care. VSP has taken quality care one step further by developing the Eye Health Management Program®, a complementary enhancement to all VSP plans, with the view that eye health, disease management, and total body health is a collaborative effort. 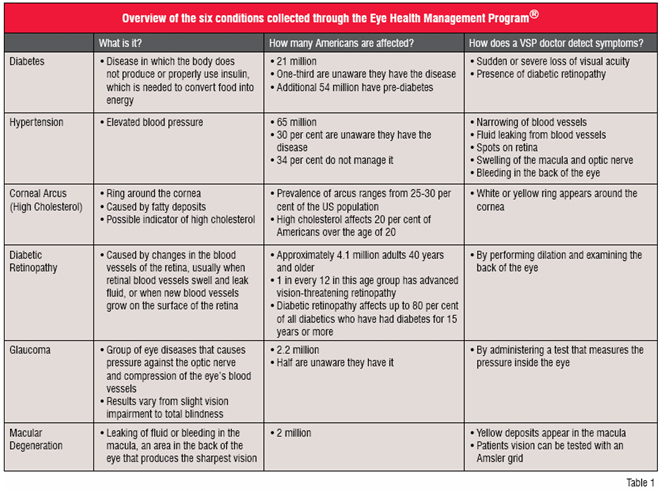 In a process compliant with privacy standards, the Eye Health Management Program® requires VSP eye doctors to report six disease states: diabetes, hypertension, high cholesterol, diabetic retinopathy, glaucoma and macular degeneration (Table 1). In turn, VSP can then take this data and share patient-specific information with health plans and disease management companies. This data collection process is unique to VSP because their private practice model allows consistent claim information to be submitted on routine vision claims. Capturing and sharing these conditions can result in significant health and cost benefits of early detection and treatment. According to data from VSP, the U.S. Census and the National Center for Health Statistics, approximately16 per cent of Americans see their primary care physicians regularly for preventive care, while about 61 per cent of Americans with coverage see their eye doctors annually. Using the Eye Health Management Program®, patient-specific information could be shared with health plans and disease management companies who may have been previously unaware of the patient's condition as illustrated in the State of California Case study. A major chronic disease focus is diabetes. Being one of the fastest growing diseases in the US, it affects 21 million Americans, and another 54 million have pre-diabetes. In addition to data reporting, VSP also provides educational materials and exam reminders to identified members with diabetes. Through the Eye Health Management Program®, VSP uses data collected by their doctor network to determine when the member last had an eye exam. If a diabetic patient hasn't returned for an eye exam after a period of time, they'll receive a reminder to visit their eye doctor. Studies show that 90 per cent of diabetes-related blindness is preventable with a regular eye exam; yet only 50 per cent of people with diabetes receive a comprehensive eye exam. One of VSP's largest clients, the State of California, announced that by utilising the Eye Health Management Program®, it could help avoid up to US$ 1 million in diabetic management costs. VSP used targeted communications to promote awareness about the important health benefits of annual eye exams. When the State's 209,000 employees and dependents had eye exams, VSP doctors collected data on chronic diseases, including diabetes, and shared with the State's health plan. So far, the results have identified 136 members with diabetes whose health plan was previously unaware of their condition. Research by Medco Health Solutions, a leading prescription drug benefit management organisation, illustrated how diabetic patients can manage to keep their disease cost at US$ 4,300 or less annually; indicating that the long-term health and pharmacy cost savings for the State will be substantial. To date VSP has 74 active clients and another 24 are in the process of participating in the data exchange feature of the Eye Health Management Program®. Since inception, VSP doctors have identified more than 250 members with diabetes who are unaware of their condition. The programme provides members with consistent, personalized care. Focusing on early detection, treatment and education management of certain diseases, the programme mitigates costly surgeries, complications and hospital stays. Additionally, the collection and exchange of medical data for VSP members help their clients manage their healthcare costs, and ensures that their members receive optimal care. Cheryl Johnson as Vice President of VSP Vision Care's Health Care Services division, is responsible for developing and maintaining VSP's network of 24,000 private practice optometrists and ophthalmologists, and oversees functions such as doctor recruitment, credentialing, quality management, utilisation management, reimbursement, as well as VSP's Eye Health Management® and mobile clinics programmes. Ms. Johnson joined VSP in 1993 and has more than 20 years experience within the healthcare industry. She attended Pacific Lutheran University and is a graduate of the University of Washington.